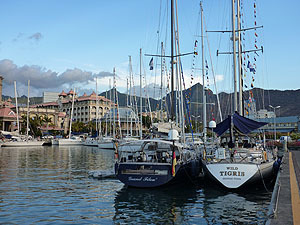 This is the World ARC rally fleet gathered in the waterfront area of Port Louis, Mauritius. The fleet of 20 yachts are about two-thirds of the way round their circumnavigation and I’m about to join them for the passage to the French island of Réunion. I’ve twice sailed in the Indian Ocean. The last time was about ten years ago when we went non-stop from Sri Lanka to the Gulf of Aden, turning right there for the Red Sea. On both occasions I recall dream tradewinds conditions and some of the best ocean sailing I’ve ever done. My impression of the Indian Ocean in the NE monsoon season is of gentler seas than the usual tradewinds Atlantic crossing. So I’m looking forward to this taste of the Trades and I hope it follows the pattern I remember. Meanwhile, I’m finding Mauritius an interesting and abundant place. This small island out in the middle of the ocean derives most of its business from agriculture (a lot of sugar cane), textiles and tourism. 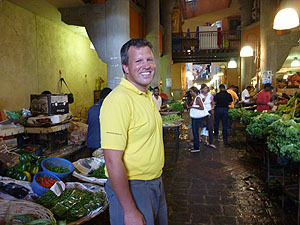 Paul Tetlow of World Cruising (below) took me to the local markets in the capital of Port Louis today, where we tried to work out what some of the fruit and vegetables were – not entirely successfully. 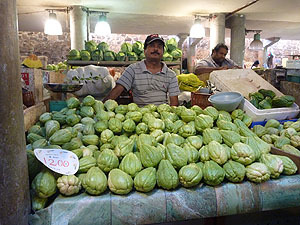 Anyone know what the vegetable in the photo below is? The vendor told us something that sounded like ‘chu-chu’ and that it is peeled and cooked like a potato. It puts me in mind of christophene, which is grown widely in the Pacific islands. D’you think it’s the same thing? 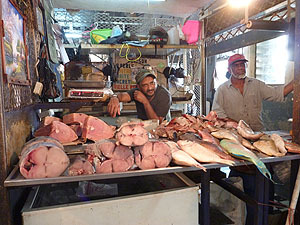 Across the road from the vegetable market is a great meat and fish market. 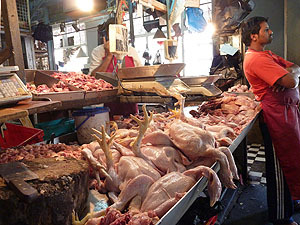 This chicken stall had cages of live birds above it ready to resupply the counter with a minimum of cosmetic alteration. Nearby, the fishmonger had a great selection of marlin, tuna, snapper and you might just be able to make out centre right a very large and brightly coloured parrotfish.